Best viewed via Netscape Navigator at 800x 600 res. Festival of the Flower Children . Woburn Abbey. August 26th-28th. 1967. An almost forgotten festival. 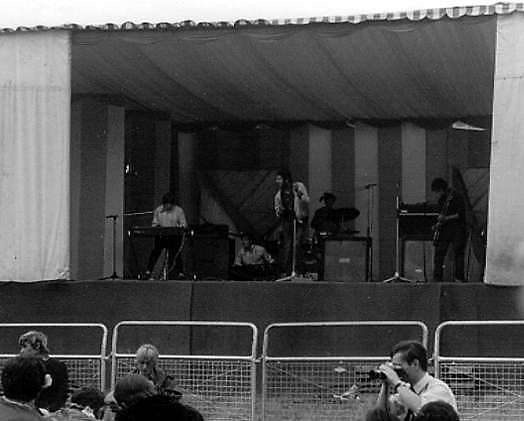 Yet it was held at the height of the Summer Of Love and was one of the first festivals to challenge the established National Jazz and Blues Festival held at Windsor. Perhaps it was the lack of name bands in the line-up that has caused it to be overlooked. It really appears to be more of Pop festival rather than a psychedelic Festival ,judging by the line-up that I have at the moment , apart from legendary psych band Tomorrow (and their set was cut short by a fire on stage caused by a firecracker thrown by someone in the audience) . "As I remember the incident. Marmalade, during their set, threw lighted sparklers into the audience, the crowd of course tossed them back at the stage, some of which landed on the canopy. As I recall, all the canopy was burned down. I also clearly remember John Peel appealing for the crowd to move back from the stage. My first encounter with Mr Peel. Breakthru onstage at The Festival Of The Flower Children, photos kindly provided by John Prior. I (Jerry Hibbert), my friends Simon 'Yid' Medalia, Jon Owen and Jerry Hughes, decided we'd go. We were sort of hippy-ish, (Art students in Oxford) so we borrowed my Mum's Triumph Herald convertible (No plate XMO 1 which I still own - the plate not the car), borrowed some of her cheap beads because we were a bit short on beads, and sugared off. We arrived very early. We must have been some of the first there. Jon was wearing a kiss-me-quick hat which pissed us all off because it was so un-cool. It was a white sunhat from Margate or somewhere with little pockets all round it with labels saying: 'beer money' 'lunch money' 'bingo money' etc. He knew it was uncool but insisted on wearing it as a rebellion against hippydom. later) I don't remember much of the actual festival. I can remember Marmalade and was a big fan of their hit "I hear the Rain" (or something). (I hated "Obli-di obli-da" - their next one I think). I recall thinking afterwards that Marmalade were the best band there (or 'group' - we didn't call them bands, did we?). Was Tangerine Dream there? Was White Bicycle? It says on the website - Hendrix was there. I was a HUGE fan of his and saw him loads of times - but I can't remember him being there - maybe he was. I remember sleeping under a tree and waking up several times during the night to hear the Doors (record) "Light my Fire" - every bloody time I woke. I can't hear that now without thinking of waking up at the Festival. I can recall hoping that 'free love' would be available. It wasn't. Not for me anyway. But finally - in the papers next day: certainly in the Daily Mail (when it was a broadsheet - and my photo was nearly full page) but others too - my photograph appeared from just after that balloon had dropped flowers. I am sitting hunched up with a carnation in my hair smoking a Number 6 but in the photo it looks like a spliff - with a title something like: "Look at the folks you meet at Woburn these days" and a lot of blurb about "it's probably disgusting but the reporter couldn't actually SEE anything disgusting going on". "Britain's going to the dogs" - that sort of thing. And Jon got his hat in the papers too. And we were on the Pathe News - Jon and I fighting over the flowers. Later on there were some TV programmes - "All Our Yesterdays" or "The Rock 'n' Roll Years" or something which featured the Pathe news material - according to friends who phoned up saying "You were on telly last night - did you know?". I never saw it. "I can't remember too much about the Woburn Abbey gig (was it the first ever British festival? ), except that it was hot - I'd joined the Royal Navy a few weeks before, and can remember being there, thinking - what the f##ck have I done!! As I said, I think we were only there for one day - did I see The Small Faces there, and miss seeing Hendrix?? I definitely saw Tomorrow though! " Jimi Hendrix, Small Faces , Eric Burdon , Jeff Beck Group, Dantalion's Chariot, Family, Al Stewart , The Bee Gees , The Alan Price Set , Marmalade , Tomorrow, Blossom Toes , The Syn , Zoot Money and the Big Roll Band , *Breakthru, Tintern Abbey. The band were very popular wherever they played being exceptionally good live, they were one of the first live bands used on Radio One's Lunchtime Club which was very popular for a time. Their musical direction was heading very into a very progressive period and the band members were writing some very good songs. An album was planned but the group broke up in late 1969 with financial difficulties. Most of the members stayed in music in one way or another, to this day. Bass Bob Booth, later Frank Farrell. I was their manager throughout their professional time.